Until 1993, John had an active and varied operational career with the Metropolitan Police, including a year with the Territorial Support Group. At the Poll Tax Riots in 1990, he found himself as Officer in Charge of the first ‘shield serial’ deployed into Trafalgar Square! Following his stint with the “riot squad”, John transferred to Streatham, where, amongst other accomplishments, he introduced a much needed database to replace the chaotic and antiquated property system. John’s IT skills brought him to the attention of the Chief Superintendent in charge of a new London-wide crime reporting system (CRIS). Unbelieveably, perhaps, until this time, if you reported a crime in one part of London, there was no way for another police station, across town, to access the details. For the last eight years of his police service, John took charge of the rollout teams responsible for installing this system in all London stations, and for training the officers who would use it. After it went live, John oversaw research and development of the system, and represented the Metropolitan Police interest in an IT working group on a related project at a national level. John retired in 2001 and, with Brigid, took a year out to travel the world. The first leg of the trip was to be a tour of America. The original plan had been to buy a motorhome, but when, on a skiing holiday, a casual acquaintance suggested motorcycles, it seemed a perfect choice. John had passed his test in 1996 as a purely practical transport solution, and had since clocked up all of 300 miles around London. 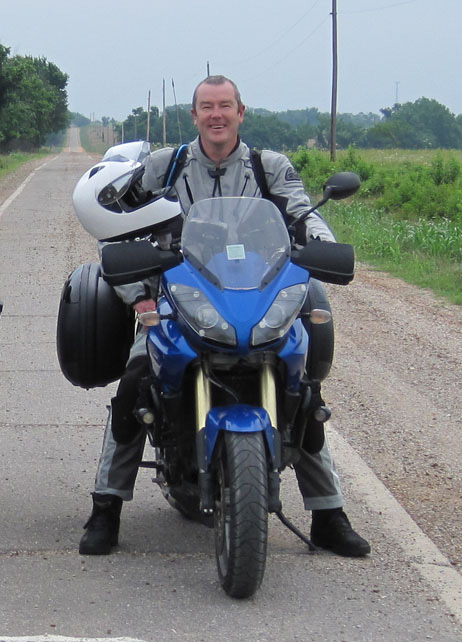 Yet, within a week of their arrival in Boston, John had bought himself a brand new 900cc Triumph and joined the 2,500-mile, week long, Route 66 Mother Road Rally. By the time he left America, three months later, John had around 15,000 miles under his belt and was well and truly hooked. On his return to London, John took up a civilian job with the Metropolitan Police, working alongside his old colleagues on CRIS, refining database searches, advising users and providing data to major investigations. The money was good but when, in 2007, they saw an opportunity, John and Brigid rented their London house and escaped to South West France for good. John is an Open University graduate with an Honours degree in IT and Computing. You can contact John at john@offonaweeride.com.